Lewis Hamilton's three consecutive wins have brought British Grand Prix ticket sales back on track, according to Silverstone chairman Neil England. England said he had some concerns early in the year, but that sales for the July 6 race were now "pretty much in line with where we'd like them to be". Briton Hamilton, 29, was victorious in Malaysia, Bahrain and China. Silverstone, which first hosted the British Grand Prix in 1948, stages its 50th grand prix this year. It is not clear whether initial ticket sales were influenced by the debate about the quieter engines in F1 this year following rule changes. But Silverstone managing director Richard Phillips said it "would appear" fans had now accepted the new, more fuel-efficient turbo-hybrid engines, which have been criticised by F1 boss Bernie Ecclestone and Ferrari president Luca Di Montezemolo. Ecclestone believes the cars are too quiet and has asked the teams to investigate ways to make engines louder. New exhausts are expected to be trialled at a test at Barcelona's Circuit de Catalunya on 13-14 May. But Derek Warwick, president of the British Racing Drivers' Club, which owns Silverstone, said he believed the debate about the noise was ill-founded. "We've gone from ear-bleeding, ear-piercing V8s to turbos," said Warwick, one of F1's rotating panel of former drivers on the stewards' panel at races. "We've had three or four years of Scalextric cars. Now the drivers are being challenged with extra power and less downforce and that, for me, is more exciting. "Would I like it to be a little bit noisier? Yes. But was I impressed with what I saw? Yes. I didn't understand what all the moaning was about." Silverstone, which alternated the staging of the British Grand Prix with other tracks until 1987, is turning the race weekend into a four-day event, during which fans will have access to the centre of the track for the first time since 2003. They will be able to visit a display of former F1 cars, as well as the paddock for the support races. Events at the track will start on Thursday, 3 July, with the pit lane open to all three-day ticket holders for the first time. The day concludes with a concert by Kaiser Chiefs. 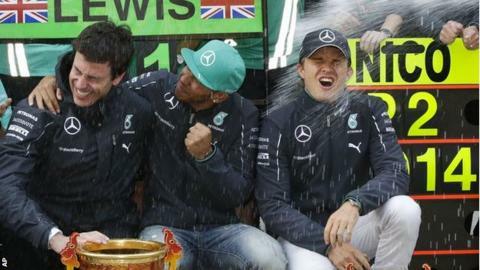 Hamilton said: "Silverstone and Formula 1 come hand in hand and you just have to look at the list of winners there to appreciate its history."